At 17, he was a member of the Dixiecats that won the Battle of the Bands on the Paul Whiteman national TV teen show. His first professional band was the Basin Street Six that included George Girard and Pete Fountain. A New Orleans native and fishing buddy of trumpeter Al Hirt, Jones was in Jack Teagarden’s last band and served as a pallbearer at the famed trombonist’s funeral. A founder and chairman of the French Quarter Festival’s entertainment committee for 22 years, he was a regular performer aboard the Delta Queen and American Queen riverboats on the Mississippi River. In 2012, he received an honorary degree from Loyola University of New Orleans. 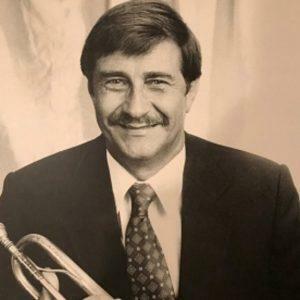 He toured with Bill Maxted’s Manhattan Jazz Band, was the lead trumpet in Pete Fountain’s band, and formed his own Crescent City Jazz Band that had a long stay at the Blue Angel nightclub on Bourbon Street. He performed at numerous festivals and on national TV shows, and was recorded on over a half-dozen record labels, most recently with clarinetist Tim Laughlin.